This professional quality vector collection features thousands of best-selling resources, as chosen by you. 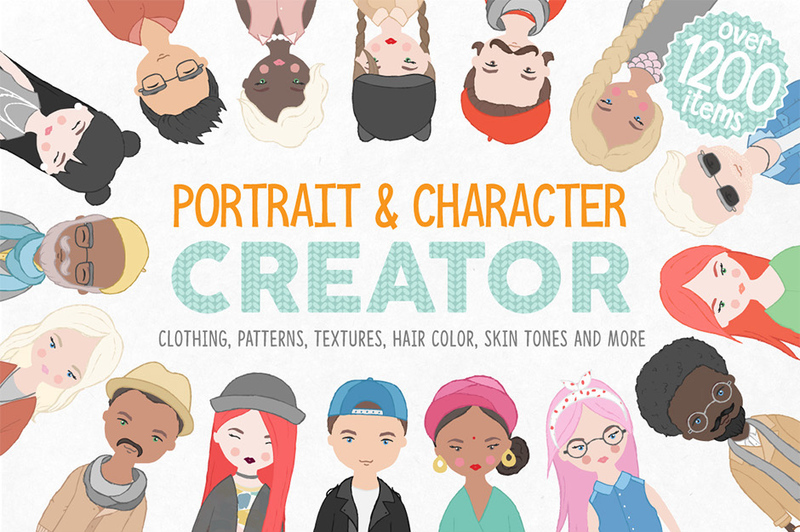 It is a comprehensive library of vectors, bringing you variety, versatility and authenticity. These resources cut the time and expense from your creative projects. For a limited time only, this collection is available for 94% off. You, the Design Cuts community, shaped this bundle. Over the past few months, more than 4000 Design Cutters have requested these vectors via surveys, emails and social media. We’ve been taking notes on every single one of your suggestions to make one epic, comprehensive vector bundle. This bundle brings you thousands of best-selling vectors, to cover any project you could imagine. The best part – for 2 weeks only – you can get access to this massive library for just $29 (or 94% off the regular price). It will save you a ton of time, effort and money. Every designer knows that vector artwork can take a huge amount of time to produce. You can easily exhaust a client’s entire budget and all available project time on a single illustration. By working with beautiful pre-made vectors you can ensure that your work retains its quality, whilst freeing up countless hours for you outside the realms of Illustrator. 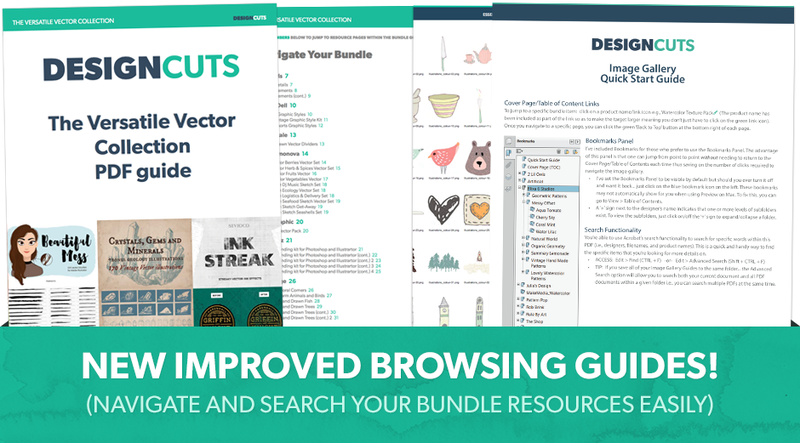 Using this bundle is like having some of the world’s best illustrators assisting you with your projects. If you’re not an experienced illustrator, then this bundle gives you professional results right out of the box. These vectors will have a transformative effect on your designs. Some can be dropped into your work to immediately add a slick illustrative touch, whilst others can be modified and customised to suit your exact needs. This library will give your work complete authenticity. This collection includes 19th Century illustrations, hand-scanned and lovingly converted into smooth vector format. These elements retain their original blemishes and imperfections that make them so charming. These precious source materials are rarely available to most designers. The variety in this collection will cover you for any project. We have included a range of effects packs, vintage designs, patterns, textures, decorative elements, brushes, flourishes, objects, animals, abstracts, hands, watercolour designs, food, borders, shapes and more! Quality is the key focus for this bundle. We’ve meticulously tested each design, to ensure that every detail is sharp, every outline perfect, and every effect seamless. These are best-selling resources, from some of the top vector designers in the world. For 2 weeks only, this collection is available at a massive 94% discount. This is a unique chance to own a high quality library of vectors that you’ll benefit from over and over again. This bundle includes our usual extended license. This means that as well as personal and commercial projects, you can use these vectors within wider designs available for resale (full terms further down this page). You can see an overview of all the fantastic vectors in this collection below. This bundle is the ultimate time saver for any designer! Introducing the all new Essential Branding & Identity kit for Photoshop, and Illustrator! Need to create a company brand, but don’t know where to start? Or maybe your clients are always “on a budget” and expect an entire brand identity for next to nothing? Well look no further because this set has it all: over 300 elements including 12 pre-made logo templates, plus a matching brand board for each logo! With loads of extra stuff ready for you to design-up a storm! A list of the fonts used plus their links are included. All the fonts are free for personal use, and most are also free for commercial use. Please read the license for each one. • Each of the 12 logo templates have either a matching monogram or alternative logo versions giving you even more options for your brand design. • I’ve retained my signature rustic style to all the illustrations so you can design with an authentic hand drawn look. • With over 300 elements you’re sure to use items from this pack for many moons to come! • I have included reference cheat sheets for all the masses of .PNG files and some basic help files to get you started! • 14 x additional colour themes for some extra inspiration! Software compatibility: The Photoshop version was created for Adobe Photoshop CS3+. The files have been tested in CS3 and newer which I guarantee. Although the files are .PNG and .PSD format which may be opened and edited in different software other than Photoshop. The designer cannot guarantee that it will work in other software or older versions of Photoshop. The Illustrator version was created for Adobe Illustrator. Unfortunately, if you don’t have Illustrator CS4 or newer, you won’t be able to edit the files. 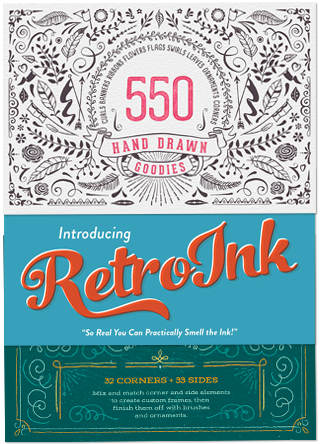 RetroInk is a massive Illustrator pack that gives you tons of graphic styles, textures, and the best-selling RetroLift effect for Illustrator. • 8 offset ink actions. Replicates the slight mis-registration of print on commercial printers. • Old ink press texture. Simulates uneven ink rollers in 50’s commercial printer. This pack was a huge amount of fun to make. You’ll get a lot of mileage out of it and it will save you tons of time in your work. You’re about to start using an amazing set of tools. Just like the go-to set of pens and pencils used by a hand-letterer, or the favourite nibs in a calligrapher’s collection, let Artisan’s Tool Chest be your new favourite digital artist’s tool box of brushes, patterns, frames, letters, and ornaments. • Brushes – 149+ Art Brushes: These 149 handcrafted, super realistic art brushes represent the building blocks of Artisan’s Tool Chest, with which nearly all of the other components may be customised. Additionally, a selection of 55 art brushes from the Basic Brushes collection creates another brush library. These brushes have been optimised to work seamlessly with the SwatchCrafter and BorderCrafter systems. Since these brushes return to the traditional one-compound-path approach, they are less resource-intensive and will also work better on machines with less memory. • Swatches – 10+ Pattern Swatches: The 10 charcoal swatches were digitised from actual charcoal scribbles. These seamless charcoal fills will realistically mimic handmade coloured areas of chalk, pencil, and charcoal. Also included are 25 variants that are less resource-intensive and will work better on machines with less memory. • Pattern Studio – Swatch/Border Templates + Actions: The Pattern Studio system is designed to streamline the tricky process of creating patterns and provide you thousands of ways to create and customise your own, using the generous selection of seamless pattern templates. SwatchCrafter and BorderCrafter provide pattern templates you customise, and then actions you use to transform your custom tiles into works of art. SwatchCrafter: Pattern swatches have reached a whole new level of customisation with SwatchCrafter. Use brushes from Artisan’s Tool Chest to customise the 22 swatch templates to your liking, and use the SwatchCrafter action to easily create custom patterns in any colour and texture. BorderCrafter: The pattern brush counterpart to SwatchCrafter revolutionises and streamlines the creation of handmade pattern brushes. The BorderCrafter action is a flexible tool to help you easily customise the 13 border templates with brushes and symbols of your choice and create your own unique pattern brush library. Dot Symbols: These 42 handmade charcoal and ink dot symbols will add a sense of fun and vivacity to the patterns and can also add charm to other elements of Artisan’s Tool Chest. • Artisan Lettering Kit: Similar to a job case of metal letters from the days of Victorian moveable type – but much more dynamic – the Artisan Lettering Kit is the crowning jewel of Artisan’s Tool Chest. These five unique alphabets (including 9 total styles) mimic modern vintage hand-lettering styles. Three of these alphabets are especially customisable, with shadows and embellishments to make the lettering your own. 9 catchword sets give the set a finishing touch. Crafted by hand with a focus on charm rather than precision, Artisan Lettering Kit will lend your design a truly handmade feel. • Artisan Framing Kit: These multi-layer framing elements can be custom-mixed to create charming artisanal borders and frames for your designs. When you use the brushes and combine ornaments along with the 60+ Artisan Framing Kit, thousands of possibilities await. • Ornaments: 60+ ornaments, sunbursts, and stars will be just what you need to embellish your design. Integrate them with brushes and frames and have fun! Software compatibility: Artisan’s Tool Chest requires Adobe Illustrator CS4 or later. Sorry, it doesn’t work with Photoshop, InDesign, InkScape, GIMP, or Photoshop Elements. Not recommended for earlier versions of Illustrator. If you have AI CS5, you can use the CS4 version. This is a very large set of hand drawn vector design elements, such as dividers, flags, ribbons, borders, corners, flowers etc., ideal for all your creative projects and endeavours. • List of all the fonts used in the design examples. • EPS8 which can be opened by most vector editors. • CS1 versions with editable text paths are also included for the design examples and the invitation template. Requires Illustrator CS1 or newer. USA flags, borders, eagles and other illustrations for the US Independence Day. A set of beautifully detailed, vintage gems, crystals and minerals, all saved in vector format. A collection of vintage illustrations of various trees. Dinosaur sculls, skeletons, mammoths and a variety of other illustrations. Vectorised illustrations from old manuscripts, Alchemy tools and elements, as well as original sketches. Some of these illustrations are more than 400 years old. Wonderfully detailed, vintage floral corners, that look like they’ve been taken from your great-grandma’s fairy tale book. In this set you get different illustrations of the solar system, the moon, the sun and many more. Gorgeously illustrated, vintage wreaths and frames, all saved for you in vector format. Wonderfully illustrated, vintage vectors of a variety of fish. Vectorised illustrations of cows, oxen, pigs, horses, goats, roosters, chicken, ducks and turkeys and other farm animals and birds. 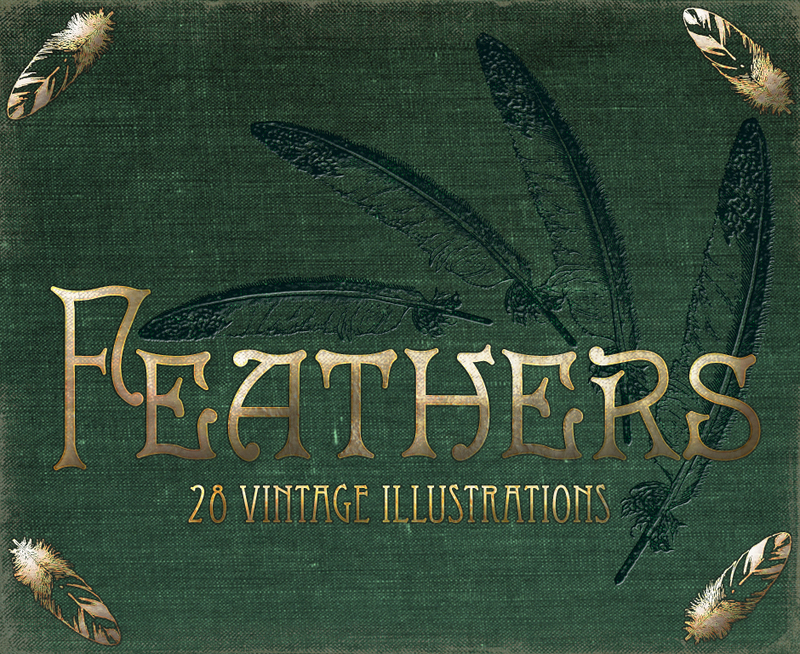 This collection is filled to the brim with amazing vintage hand vectors. You can easily edit, resize and recolour this product in Adobe Illustrator. The vector objects (transparent .PNG and high resolution .JPG) are grouped and separated by layers. • 3 .EPS Adobe Illustrator vector files. • 3 Hi res .JPG files (abt 3000×3000). • 3 .PNG files with transparency (2000×2000). 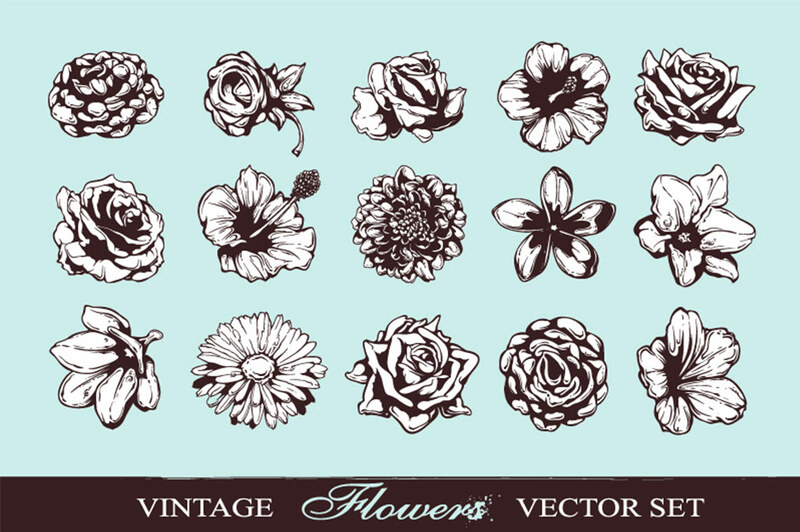 This is a set of vintage handcrafted flower vector illustrations. You can easy edit, resize and recolour this product in Adobe Illustrator. Vector objects are grouped and separated by layers. • .EPS Adobe Illustrator vector file. • Hi res .JPG file (abt 5000×3000). This is a vector set of useful grunge design elements: smudges, splashes and brushes. You can easy edit, resize and recolour this product in Adobe Illustrator. Vector objects are grouped and separated by layers. • .AI Adobe Illustrator CS+ vector files. • .EPS Adobe Illustrator CS+ vector files. Set of 40 different vintage elements perfect for restaurant and coffee branding or wedding invitations. All items are well organised and layered. This is a huge collection of 107 pieces. These beautiful graphics were created from an antique illustrated business book circa 1890 that I have in my collection. The incredible amount of detail in these graphics are sure to make your projects stand out! Truly a unique collection to add to your design arsenal since the antique source I have is very rare! These are true vintage graphics – as such I have purposely left in some of the imperfections on the graphics to really add to the authenticity. You’ll find this set full of beautiful pieces you can use to brand your business, use in your logo, make greeting cards, invitations, stationery, in your design work, etc… The uses are endless! Software compatibility: Adobe Illustrator CS3 and up or other vector program to work with the .AI or .EPS files. The .PNG product can be used in multiple products including Photoshop and Photoshop elements. This is a huge collection of 240 pieces. These beautiful graphics were created from an antique wood carving catalog circa 1905 that I have in my collection. The incredible amount of detail in these graphics are sure to make your projects stand out! These are true vintage graphics – as such I have purposely left in some of the imperfections on the graphics to really add to the authenticity. The styles included in the graphics are pieces from the Chippendale, Hepplewhite, Edward and Mary, and the Adams time periods. Truly a unique collection to add to your design arsenal since the antique source I have is very rare! You’ll find this kit full of beautiful pieces you can use to brand your business, use in your logo, make greeting cards, invitations, stationery, in your design work, etc… The uses are endless! • 240 unique antique graphics in .AI, .EPS and .PNG format. (The Png’s are approximately 6″ in size). • This is a very large file – approximately 350mb – please allow time for your download. 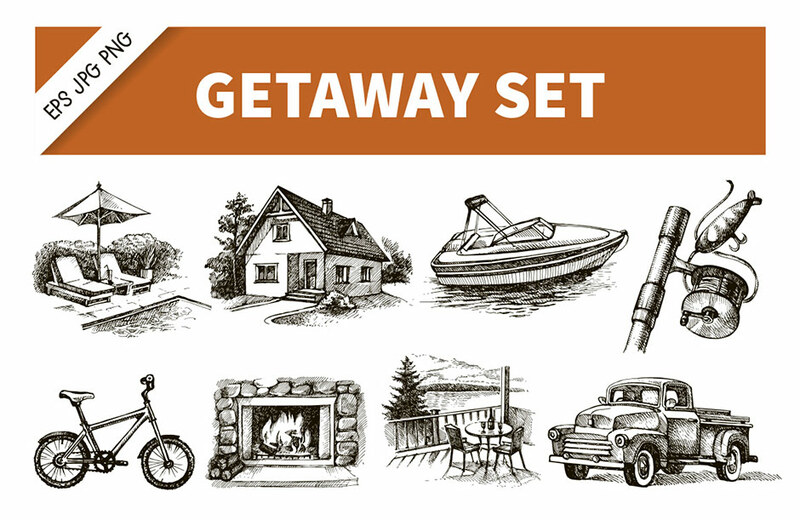 Set of hand drawn vacation sketches in vector format. 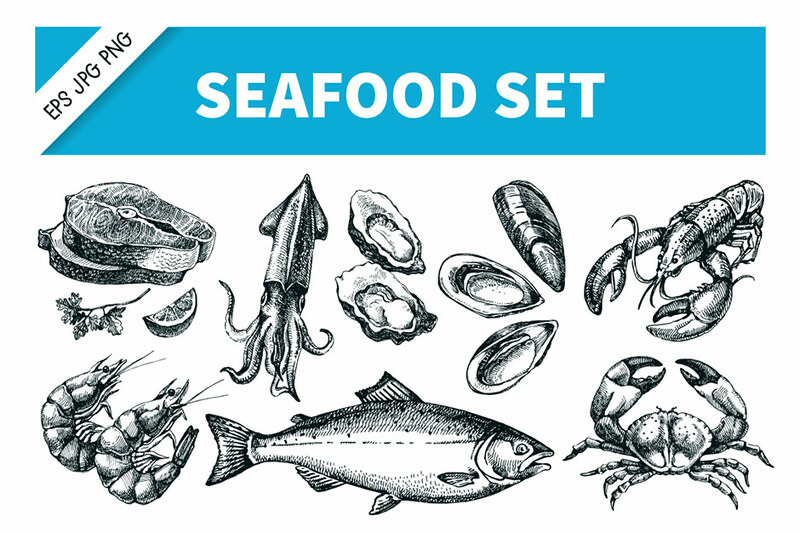 Set of hand drawn seafood sketches in vector format. Set of hand drawn vintage ecology sketches in vector format. 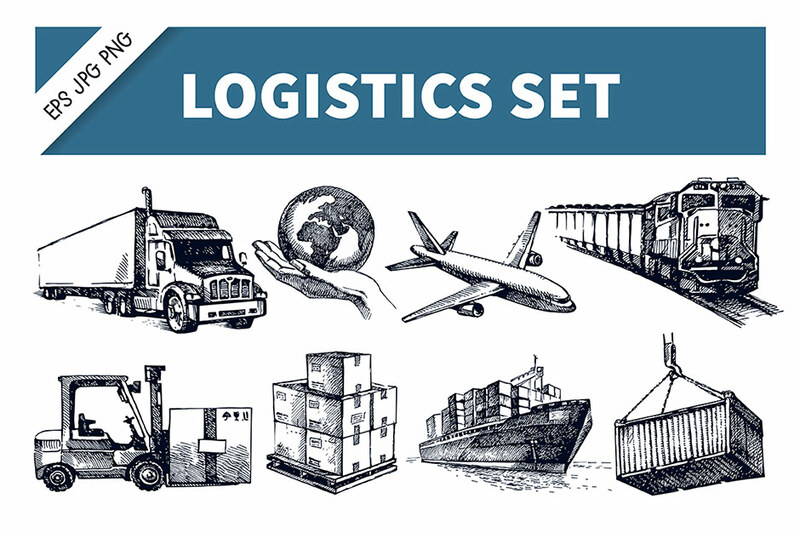 Set of hand drawn logistics and delivery sketches, in vector format. Set of hand drawn vintage music sketches, in vector format. 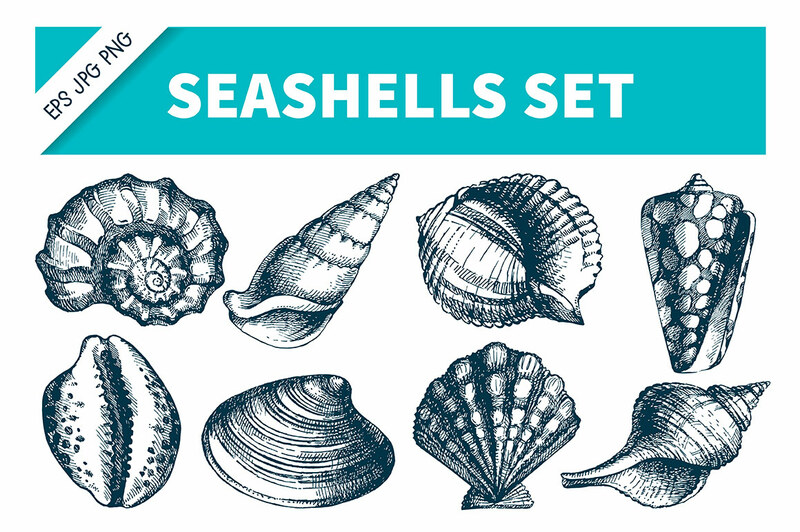 Set of hand drawn vintage seashell sketches, in vector format. Set of 15 hand drawn watercolour herbs and spices, all provided as traced vector illustrations. Set of 10 hand drawn watercolour berries, all provided as traced vector illustrations. Set of 20 hand drawn watercolour fruits, all provided as traced vector illustrations. Set of 20 hand drawn watercolour vegetables, all provided as traced vector illustrations. Graphic Styles are vectors for Adobe Illustrator. They work on live text, there is no need to expand the text first or run an action – just apply the graphic style to your type object and edit the text as needed. This is great for last minute client changes! Load the Allsorts Graphic Style Library and you will have a palette of 50 graphic styles ready to apply. The pack includes 3 free tilable vector grunge textures as graphic styles and they are included in your swatch palette. Software compatibility: Illustrator CS3+. Unfortunately this set won’t work in Photoshop or any other graphics program besides Illustrator. Advanced editing requires basic knowledge of the appearance panel and scaling tool. Penman Vintage Graphic Styles Kit for Illustrator CS3+ allows you achieve a realistic Victorian Era type in just one click. Just apply to your text and it stays live and editable in your document. Client change? Typo? – Not a problem, just re-type as usual. You can also change colour easily with global swatches. BONUS 12 Line ornaments – non-expanded strokes, you control your stroke weight, or turn into a brush! 4 Old Paper Textures included – add them on the top layer of your artwork and set to multiply for the finishing touch. Software compatibility: Illustrator CS3+. Unfortunately this set won’t work with Photoshop or any other graphics program besides Illustrator. Advanced editing requires basic knowledge of the appearance panel and scaling tool. Introducing 80’s Retro Graphic styles – 117 crazy 80s styles for your next typography project. Works on live text, no need to expand text first or run an action – just apply the graphic style to your type and it will remain completely editable. Please read the “README” file before use – the ‘wave’ styles have a little trick to them that you’ll need to know first (see page 5 of the Read Me .PDF). Styles created for 72pt text by default. See read me .PDF for scaling instructions. • .PDF Read Me File – instructions for best use, editing and troubleshooting. Includes a list of free fonts used in the preview images and clickable links to each. Software compatibility: Illustrator CS6+. 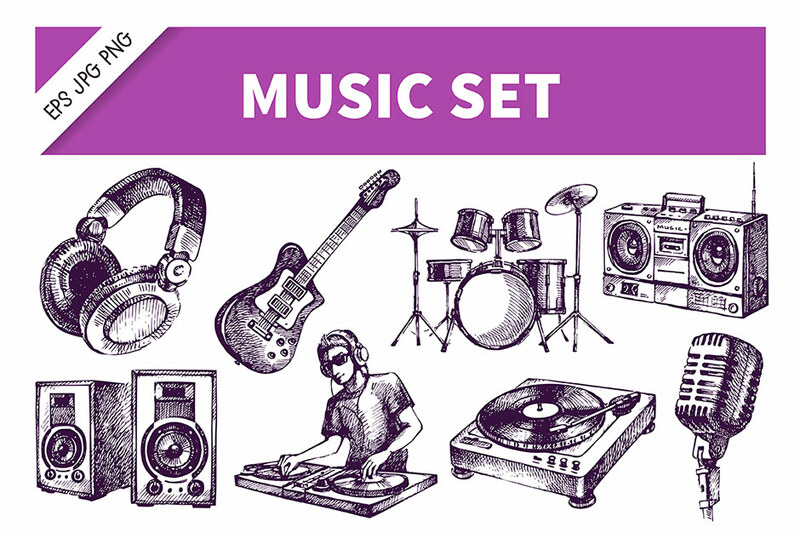 Unfortunately this set won’t work with Photoshop or any other graphics program besides Illustrator. Advanced editing requires basic knowledge of the appearance panel and scaling tool. Ink Streak is A set of 16 Actions for Adobe Illustrator that enable you to apply custom streaky ink effects to your designs in seconds. No need to fiddle around with clipping masks and huge memory-hungry textures that slow down your machine. Simply select your object, ‘Play’ the Action of your choice, and enter the appropriate settings to create a streaky vector ink effect tailored to your needs. Each individual Action has the power to produce a wide range of effects, making the set as a whole incredibly versatile. User guide – Unfamiliar with using Actions? No problem! Ink Streak’s in-depth user guide takes you through the whole process step by step. Cheat sheet – See examples of effects that can be created with each Action and learn which settings to use to create your own similar effects. Perfect for adding some extra texture to your designs. • 10 streaky ink textures – High-resolution textures (3508 × 2480 px) delivered in .JPEG format. • User guide (.PDF) – A step by step guide to using the Actions. • Cheat sheet (.PDF) – A collection of example effects with info on how to recreate them. 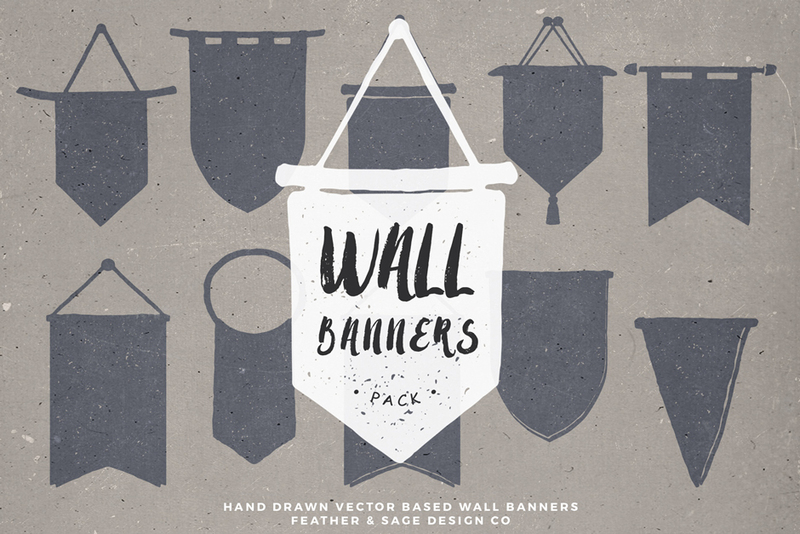 This pack contains 19 hand-drawn vector dividers for your design & web projects. Great for web templates, presentations or any kind of work. Includes Illustrator .AI, .EPS and transparent .PNG files. Individual .EPS & .PNG files for each divider. Adjustable stroke width and colour. Each divider width is 780px. Let’s mess around with our vector art, shall we? I am very happy to introduce to you the Beautiful Mess – the pack of vector brushes that will help you achieve that delightful hand-drawn look in your vector art or even text. I’ve been playing with these brushes for a while now, and it’s been so fun and easy to draw with them! This pack is quite big – 325 brushes from thin to thick, from longest to shortest, all kinds of brushes you will need for drawing in Adobe Illustrator. This pack comes with a bonus treat! One of the best tutorial authors, who also happens to be my dear friend, Yulia Sokolova (aka Yuzach) has prepared for you a comprehensive tutorial on creating a beautiful vector portrait in Adobe Illustrator using Beautiful Mess Brush Pack. In this tutorial you will not only learn how to use these brushes, but you will also find some tips and tricks to get the most out of drawing cartoon characters in Adobe Illustrator. • Bonus – amazing step-by-step tutorial from Yulia Sokolova presented in a .PDF file. Presenting you the first ever vector brush pack by Pixelwise Co. It includes 70 seamless pattern brushes for Adobe Illustrator and 12 vector logo templates made with these brushes. All the brushes were drawn by hand on paper using ink, so be sure to check out those rough edges of the brushes in this demo. All the free fonts used for these logo templates are listed in the .PDF file that you will receive with this zip. You will also have a nice Brush Guide .PDF with the full list of brushes. Hand drawn “Good Vibes” collection contains all you need to create trendy boho style logos, invitations, greeting cards, branding identities, labels, badges, banners, prints, patterns – whatever you can imagine. This is a collection of 40 textured geometric vectors. These vectors are resolution independent so you can scale them to any size required for your projects. • 40 individual geometric textures, supplied as Illustrator 8.0 .EPS files which are compatible with most vector and bitmap applications such as Adobe Illustrator and Photoshop. Software compatibility: Full editing of the source files requires a vector application such as Adobe Illustrator, CorelDRAW or Inkscape. You can also open each texture with a transparent background at any resolution required (rasterising) in an image application such as Adobe Photoshop. 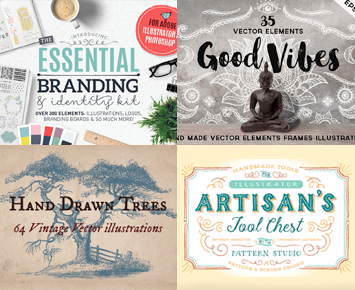 This bundle offers huge variety of quality vector designs, including decorative flourishes, vintage packs, themed packs, vector brushes, branding kits, food vectors, textures, effects packs, shapes, dividers and much more! Deal includes extended licensing. You can use these items within commercial projects and items for resale (as part of a wider, original design). File size is approx 4.8GB unzipped (split into 15 parts or an optional one click download). A pdf guide has also been provided for easy browsing. Thanks for the comment on this one! Unfortunately we no longer operate master lists for bundles as since we opened our Marketplace in Feb 2016, we have not had any of our older bundles as re-runs. This is because a lot of the most popular items from our expired bundles now go into the marketplace! Thank you for the comment on this one but I am afraid that this one is no longer available so I won’t be able to set you up with this. All of our bundles run for a 2 week period only which is why we are able to offer them at such a heavily discounted price. I hope this helps,Carlos! If you have any other questions or if there is ever anything else I could assist you with please do get in touch. I’m always happy to help! Is it possible to purchase a few of the items individually since this bundle is over? I am wanting the branding kit, hand drawn tree, beautiful mess and the decorative brushes. I did a search on the branding kit and couldn’t find it. Thanks for the comment on this one and hopefully I will be able to help! I know that the Branding Kit is definitely available there and you can see that here: http://bit.ly/1NyOrX5 You can also pick up the Vintage trees here: http://bit.ly/2nXg8GK. Unfortunately we don’t have Pixelwise Co’s Beautiful Mess or the decorative brushes but i would recommend checking out the marketplace for similar items! You can also save up to 50% off the listed price if you use our ‘build a bundle’ feature :). Thank you so much for your comment. I’m really sorry to be the bearer of bad news but I’m afraid that this bundle is now completely expired so I am unable to set you up with it. I apologise for any inconvenience caused but if there are any items in this bundle you were interested in, please do let me know and I will happily point you in the right direction to purchase them separately. I hope this helps, John, and please don’t hesitate to contact me should you have any other questions. I’m here to help! Will this ever go on sale again? I would love exactly this package! I don’t get online much so I cant really follow these amazing offers. Do you have a subscriber list of some sort, so I can get a heads up? Would really appreciate that! Thank you so much for commenting. I am really sorry but I am afraid that this bundle is completely finished so I am unable to set you up with this. I apologise for any inconvenience caused! 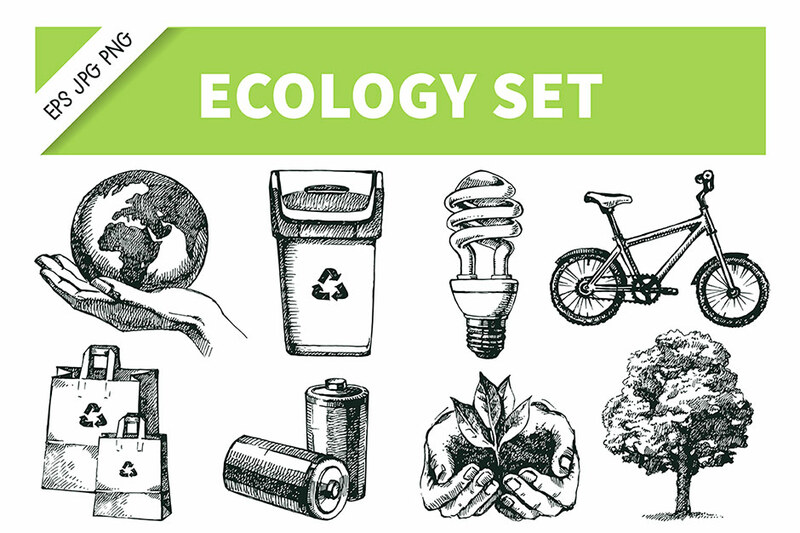 Is it possible to buy the Ecology bundle? I’m also interested in the Good Vibes. (Would buy the bundle if ever offered again) Thank you! I only learned about this site a couple of days ago via Lisa Glanz’ Instragram. Loving the site but boy, it burns to have missed this ludicrously amazing deal. Not that I am complaining, of course. Just feeling anecdotal tonight. Especially considering that I just got the Essential Branding & Identity kit. Knowing that for just $4 more I could have gotten all these beauties is haunting. Thanks so much for your comment on this one! We are so pleased that you have found us and let me send you a huge welcome from the entire team. If you have any questions on anything you see, please do let me know! I am so sorry to hear that you missed out on this one! Unfortunately this bundle will not be featured again! The good news is that you may still be able to grab some of the items from this bundle in our marketplace. The way our marketplace works is that it will allow you to grab some of the most popular products from past bundles as a kind of second chance if you missed them the first time around. You have the option to build a bundle if you wish to or you can just purchase whatever you need. That is awesome to hear you grabbed the Essential Branding and Identity Kit and I hope you get loads of use out of it. However if there was any other item you were particularly after, please do let me know and I can try and get this into the marketplace for you :). Ah, what do you know. I did find the thread after all. It took some Sherlockian abilities but here I am. Yay, me. B. Cumberbatch should be ever proud. Anyway, I do want all the products. All of them. But! Will I have the money to get them. Absolutely no. Actually, that’s a lie. All of them except the 4th of July one. Too much Americana for my taste. But oh, be still my silly geeky heart, the Crystal, Gems & Minerals, the Prehistoric Animals, the Alchemy, the Astronomy vintage collections! Then there’s the Music collection (I’m a DJ), the Ecology set, all the retro vectors and the Artisan’s Tool Chest… Just my luck that I didn’t know this place existed until now. Will Lisa Glanz’s essential branding and identity kit be updated in this bundle? I see the updated version is listed in the new marketplace, but I haven’t noticed an update for it in my account. Thank you for getting in touch, I can certainly help you with your query. I hope this helps, Cassara, and please don’t hesitate to contact me should you have any other questions. I’m here to help! I want to buy it so bad! Thanks for the comment on this one! Oh no, I am so sorry that you missed out on this one and I really wish I was able to mend your broken heart but unfortunately this deal has totally finished! As this bundle has just been run, it probably wont be used as a re- run in the next few months Kirstie but I have added you to the list for this so if it does come round again, I will definitely be in touch. Or if there was any particular items you were after from the bundle, please do let me know and i can direct you to the designers store! I’m interested in adding this to my collection, but I don’t have Illustrator, just Photoshop. Can you send me the info on which parts are not usable in Photoshop? I have just sent you an email about what resources will work for you in Photoshop. I hope this helps, and please don’t hesitate to contact me should you have any other questions.I’m always happy to help! Oh @#$!$% (bleep!) Ink Streak is my new obsession! Bought it (mostly) for this amazing tool and got a fat load of nice bonus items…. there goes my weekend. ‘Scuse me while I go streak everything I’ve ever drawn. Thanks again for your comment, if there is ever anything I could assist you with please do get in touch. I’m always happy to help! Thank you so much for bringing this deal back for your 2nd birthday! You are more than welcome for this! We are just so pleased to be able to give our community the chance to grab any bundles they might have missed out on in 2015! I really hope you’ll enjoy your new resources and will get loads of use out of them. We have lots more treats coming for our birthday celebrations so keep an eye out on or website and social pages :). In the mean time please don’t cry as I’ve added you to the master list for this bundle and I’ll be sure to drop you an email as soon as this bundle is live again. OMG! I love most of the contents in this pack! Wish I could still buy it! Possible? Thanks for your comment! I’m really sorry but I’m afraid this deal is now well and truly finished, so I won’t be able to set you up with this. However, sometimes we do re-run an older deal as a special bonus, in conjunction with a new deal. The best way to ensure that you don’t miss a deal is to join our free newsletter, by signing up at http://www.designcuts.com. In the mean time, I will certainly be keeping you updated should this bundle be made available again 🙂 I’ve sent you a quick email to help with this! I miss this bundle. And no one comment for me. So sad. Hiks. Anychance to have this? I’m also late to the deal! 🙁 Any chance I can still get it very please? Thanks! Thanks for the comment and better late than never in my book :). I can definitely help you out with this- I have sent you over an email which should help you out! I am also late to the deal, is it possible you send me over an email too ? Thank you for getting in touch, I’m really sorry to hear you missed this deal, I can certainly help you out with this! I am so sorry I missed this amazing bundle. Is it possible to buy it yet? Thanks for commenting- i am so sorry to hear that you missed out on this one too! It has expired but i have sent you over an email which should help you out :). Thanks for commenting- I hope you got away somewhere nice for your vacation and had an awesome time! I certainly couldn’t leave you in need of this one so i have sent you an email which should help :). I just love your site and can’t wait to receive your emails with new things to download!!! When I saw this pack I couldn’t wait to get back from holidays to download it! I didn’t realise it would expire so soon and I am so upset I have missed out. I am currently designing my wedding invitations and this pack has everything I need! Is there anyway to get this even though I am late! I hope the wedding invitation designs are going well! If you ever wanted to share your work we would love to take a look! Thanks for the comment and the awesome feedback on this bundle! I could not stand in the way of your love for this especially since you added the sugar on top :). i have sent you over an email which should help! I, too, am sad I missed the deal! 🙁 I keep clicking the expired button- just in case! Haha. Thanks for commenting on this one! Unfortunately hitting the expired button wont help you with this one Emma- I definitely can :). I couldn’t have you feeling sad so i have sent you an email which will help! Such a fantastic package (and website!). In hopes of the other comments, would there be any way to get in on this deal (even though it’s quite expired)?? Thanks for commenting and for your lovely kind words on our website- your feedback is very much appreciated! I would hate for you to be left out on this one so if you check your inbox, I have sent you over an email to help out :). Hope you are able to do something for me. Thanks for commenting and i think i can help you with this :). I have been able to help a few late arrivals out with this one and I couldn’t leave you out of the party either! I have just sent you an email that should help! hello is it possible to add this deal thank you. Thanks for the comment! I can definitely help you with this :). I have sent you over an email to help you out with this one! I hope this helps, and please don’t hesitate to contact me should you have any other questions :). I missed this, anychange how to get this. Thanks for getting in touch, I apologise for the delay in getting back to you! I am so sorry I missed this bundle :-(. Thanks so much for commenting- I am so sorry that you missed out on this one! Lets see if i can turn that sad face into a smiley one- I have just sent you over an email that should help :). Are they likely to be available again? Let me just drop you an email about this. I was to late to buy this bundle :'( Is it possible to buy it? I am so sorry for the delay in coming back to you about this! I can definitely assist you with this :). I have sent you an email to help and again, my sincere apologies for not being in touch sooner! Could you add me to the list when this becomes available again. I missed out. Oh no! Let me drop you an email Carol. Darn it! I thought I had more time! Oh, well! Maybe, next time it comes around? Thank you! I think this one took a lot of people by surprise when it expired! I can certainly pop you on the master list but if you were keen to still grab this one, i have popped you an email which should help :). Thanks for commenting and for letting us know what resources would be helpful for you! i have popped these onto our list for sourcing and we shall definitely work on getting some Victorian/ Georgian resources! if you come across any links yourself, please do email them across to me :). Oh i love the idea of some really authentic Mexican elements although I’m not going to lie, I am also now craving crispy tacos as you mentioned them…I will get the team on the hunt and hopefully we can get something for you! I bought this set last week, knowing that most of this goodness would work for me in PSPx7. Some will not, but that can serve as inspiration, at least. Elena Pimonova’s sets are gorgeous! I was really wishing that the fruit and veggie sets by were clean watercolours, and the splatters were just for preview, but they are beautiful anyways. Remember though that we can dirty them up if we need to, but it is really hard to clean up spilled paint! By the way, I did notice there were no cake and cookies available there! All of these sets are beautiful, as are the ones in the re-released set, which I just bought today. I had to wait until the new month, so my credit card would not cry!! You only get 5 stars, because that is all that is available. Thanks for the awesome comment and the 5 star review! We are beyond grateful! We are so pleased to hear that even though there are resources you are unable to use, the are still inspiring you and your work ! Does anyone know if this artwork is compatible with Corel X7? I was just going to ask the same question. I have CorelDraw X7 as well and would love to purchase this package if it works with it. I am after graphics to engrave and laser cut out. Thanks for commenting! If you can let me know which resources in particular you were keen to use for your project, i can let you know if these will work for you. After the initial shock, here’s a more sensible comment! I always loved working with line art and b&w illustrations and this bundle is truly a treasure chest, which I will use regularly in my print and web projects. And the image gallery document! It’s a very very welcome addition, that makes the bundle even more appealing, as you can download what you need when you need (and even copy/paste from the pdf for quick lo-res comps). Thanks guys, as always, you did an amazing job! We find the Image Gallery really useful ourselves. It just makes searching for resources so much easier. I personally love the Alchemy vectors as well. They immediately caught my eye when I worked on the bundle page. that’s what I expect from my friends at Design Cuts on my return from holidays! Now, make a color separation of that lovely menu in your demonstration tutorial. Do so in such a way that a print house doesn’t reject the file or charge an arm and a leg to process all those thousands (!) of tiny, obscurely arranged, impossible to gather, wrongly-shaped and -stacked vector fragments–no two of them the same color– created when those gorgeous watercolor files were Autotraced. Autotrace does not work for professional output. Period. To sell resources as if they were for designers, and then to provide professionally useless items, is misleading in the extreme. Hey Jason, thanks for your comment. I’m really sorry that you didn’t enjoy the tutorial by Renee, or find it suitable for a printed outcome. In this case, the tutorial was simply meant to inspire our community, and give them some ideas for building up a creative layout. The menu could have easily been intended as a digital pdf invitation, rather than a printed outcome. Either way, you’re spot on with your comments regarding the difficulties surrounding printing. We’ve been receiving a ton of great feedback from designers in our community who have been using and benefiting from these vectors, but if they’re not right for your needs, I’d love to rectify that. I’m dropping you a personal email now to see how we can help. Every month I say to myself “no I won’t buy this month’s deal – I’ve got more than enough resources now” and every month it’s the same problem. I open the email, see awesome deal and my money finds its way to Design Cuts. I just can’t help it. Maybe next month I’ll be stronger. Thanks as always. I think. Thanks for the lovely comment! We are so happy that we continue to tempt you with our bundles. Tom just has the knack of finding some really amazing resources that are too hard to say no to! I really hope that you will get loads of use out of them though which will help ease the wallet pains :). I would love to see what you are working on so please do feel free to share your deigns if you would like to! Does anyone use Affinity Photo or Affinity Designer? I can’t afford Adobe’s subscription at this time so I’ve been using Affinity. So far I’ve been able to use most of my Design Cuts purchases but it would be nice to know for sure which products will be compatible before buying. I’m specifically interested in the vector art brushes. Will they work in Affinity Designer? I’ve heard quite a few community members are using Affinity Designer, so this is definitely something we’ll be looking into in the future. After doing some research I can see that Affinity actually supports quite a lot of file formats. They also host a bunch of tutorials on their website that will talk you through how to use certain resources. You can find all the tutorials here: https://affinity.serif.com/en-gb/tutorials/. They also have a really good forum in place, which should help with this: https://affinity.serif.com/forum/. PSD files will all open fantastically in Affinity and for the AI files, if you save the file as an .eps or .pdf you should be able to work with them in Affinity as well. I hope this helps, but please do feel free to get in touch, and we’ll be more than happy to help. Thanks for your comment! I am so sorry to hear you are having an issue with your Pixelwise folder- i have sent you over an email to get some more details from you and rest assured, we shall get you working with your resources asap. I just saw your reply to someone asking about Zazzle and Cafepress. Do you mean that I can’t create, say, a t-shirt or greeting card using elements and fonts I purchase from Design Cuts and sell it on these sites? This is very distressing. Thanks for the comment! please dont worry- let me see if i can clarify this for you! You can definitely use your resources to create items for these POD sites but they must be a finished flattened product for the client ie the client cannot customise the design at their end as if they did, they would be working with the resources and would require a license to do so. If you have any concerns or would like me to check your design to make sure it comply’s with our TOU, please do email me directly! I hope this helps, and please don’t hesitate to contact me should you have any other questions. Thanks for making this clear Carol. I was having the same thought as Angela. You are more than welcome Prihatini! If you do ever have any questions on licensing or there is anything you are unsure of, please always let me know! I am more than happy to help :). YES. This is THE ONE I’ve been filling surveys for. Thank you, people at DC, for hearin’ my prayers!!! Haha I’m so glad you like the bundle Diego. I know that Tom tried to tick as many of the survey response boxes as possible with this one. 🙂 Enjoy your vectors! Does extended license allow use on print on demand sites such as zazzle and cafepress? Thanks for commenting! I can definitely help with your query. Unfortunately our extended license does not allow for using your resources on print on demand sites- as the customer on these sites would effectively be working with the resource, they themselves would need to have a licence in order to be able to do so. I hope this doesn’t disappoint you too much and if you do have any further queries, please do let me know- I am more than happy to help! Just bought this deal…very excited to use it!! I am slightly new to the designing world and am wondering if anyone has tips on how they organize assets like this on there comp (this is my 3rd Design Cut purchase)? Right now I feel as I have items everywhere and miss some when looking for ideas. Whenever I get something new, I start by putting it into the appropriate folder (see example below). Then, AND THIS IS THE KEY, I add keywords/metadata tags. By adding this info, the actual location becomes less important as all I need to do is search and there it is… a nice preview window full of thumbnails that you can resize at will and/or go full screen. You can also select multiple files/folders when tagging as opposed to having to tag each file individually so it goes pretty fast. This isn’t absolutely necessary w/Bridge, I’m just a bit of an organization freak and have 50+ TB of content to navigate. Top Level: Audio, Design Assets, Images, and Video. If there are items that I search for on a regular basis e.g., ‘Grunge’ or ‘Watercolor’, I set up Smart Collections. After defining a Smart Collection… Bridge will AUTOMATICALLY put a virtual copy of ANY file(s) that I tag with the keyword Grunge and/or Watercolor into the appropriate Smart Collection(s). Then in the Smart Collections Panel… I just click on Grunge or Watercolor and view all my files (regardless of the actual folder they reside in). At that point, I just select the file(s) I want to use, double click to open in the appropriate software, view the folder they reside in, etc. Here is a short how to clip from Lynda.com (Julieanne Kost). She is using CS6 but it’s the same in CC. I also create regular Collections i.e., for a particular project I’m working on and then manually drag virtual copies into that folder or right click and add. Regular collections tend to be more of a temporary thing for me but prove to be quite useful when I have assets from multiple sources. In any given folder, you can filter by file type, date, and any other number of criteria. The Search and Filter tools are quite extensive once you dig in and snoop around. Below each thumbnail, you can have up to 4 levels of detail e.g., file name, date created, size, dimensions, etc. but you can also color code the file name and/or apply a 0-5 star rating system (and of course filter by those also). You can change the text for the Color Coded Labels to better suit your needs. – Open Files: after setting up the appropriate associations in Preferences, just double clicking a file will open it in that application. You can select multiple files and open them and/or select multiple files and open them as individual layers in one PS file. You can also drag and drop from Bridge to PS, AI, Windows Explorer, etc. – Batch Rename Files (BIG TIP: I’ve noticed some people rename files they get from designers and to each his own but this will make syncing updates a whole lot harder. I suggest instead to add the file name you want to the original file name.) If you do rename files, you can also choose to keep the original file name as part of the metadata. – Camera Raw: access ACR w/in Bridge, tweak one file and apply tweak to multiple, work on multiple files at once, etc. Thank you SO MUCH, Julie Meredith, for this lesson about how Bridge can actually be the tool it is supposed to be (a good organizer rather than just a viewer or regular explorer). By opening and kindly showing your workflow to all of us you have made it look much useful and easy to start using it the right way. You’re welcome… if you have any questions, please let me know. BTW, just noticed I used an older version of this write-up so please note the update below. WOW. Thanks a tonne for this, Julie. Like Mary, I am very new to using all these tools and I am very lost. I don’t have Bridge or any Adobe app other than Illustrator and I didn’t even have that three weeks ago. Total newbie. I’ll have to re-read your blurb a few more times before I even can begin to grasp all that is there. This collection is so good! Okay, you win! This collection is amazing, soooo many wonderful goodies to play with! 😀 Those handdrawn vectors are gorgeous! Agree with Nidhi and Shara — really no use resisting anymore, is there? I only wish there were a master index that might direct me more quickly to “that perfect vector swirly frame” that I saw in “what the heck fantastic package was that?? ?” Or “that unique curlyish-sans-serif-font-that-had-20-weights-in-the-package” . . . oh my, how to research these abundant resources?? I LOVE the PDF Guides for each package! But now that you (and I) have created the awesome Design Cuts Library, what’s the Do-We Decimal System? 🙂 C’est possible? Bought 2 fonts packages today and now here’s this irresistible vector package. I keep saying No, I won’t use that . . . or that . . . but the 3 things I WILL use are worth the 29 bucks. Aren’t you being just a wee bit cruel, dear DCs? [-D I guess if it’s art vs: food, you win again! 3 stars for the stuff I’ll actually use, but 5 hats-off-to-you for doing what you do and providing inspiration for us all. I have reverted to absolute old school. The new PDFs- Printed and in a folder. trust me works the best! Also I don’t download every bundle or everything I buy. Just download the PDF – Colour print and vola my own personal library sheet! Also if I am working on a client project – I tend to create one illustrator file and keep dumping all the different resources used on that project. This helps me be consistent with that clients project. I am illustrator user, so this deal is heaven sent…. I do agree with that we need more modern (handdrawn or not) vector. Thanks for the really helpful feedback. As Julie said below they Image Galleries are actually all searchable, which should hopefully help you find what you’re looking for in each bundle. I’ll drop you an email now with some more details. I’ve been waiting for a blockbuster vector deal, so this is a great addition to my collection. My only comment would be that I wish there were more modern/contemporary styled content, as you’ve done many vintage/retro styled options before. But, other than that minor gripe, it’s an absolutely great deal with more content than I could ever use. Thank you so much for your comment and feedback on this bundle! I am so sorry if the vintage options aren’t too your taste- we put this one together using the feedback we received from our community surveys so my apologies if we are missing elements that you suggested. Please do send me over any contemporary resources that you would love to see featured and I can definitely get working on sourcing them for you! We are super pleased to hear though that you are enjoying the bulk of this one :). Nice bundle however too much cool stuff that can only be used in Illustrator and not Photoshop. I absolutely hear you. Unfortunately that is the nature of the beast with most vectors, as they tend to be primarily for Illustrator. Many of the resource sets do however offer Photoshop compatible versions as well, so most of them are still usable in other softwares. I am really regretting not buying the deal with all the watercolour stuff from last month! I am so sorry to hear you missed out on our Inspirational Artistic Design Bundle. However I can add you to the master list for it so that if it comes around again as a re- run, you will be able to purchase it again! If you can let me know, I can pop you on the list! Awesome! Had been wanting the Design Dell styles but needed the extended license. We are so pleased that you’ve been after Design Dell and we are so happy to be able to help out with the license :). I would love to see what you create with these styles so please do feel free to share! Will you be able to sell your secret recipe on how making an irresistible deal on your next bundle? LOL I can’t help myself, need to have this bundle! Even I am not privvy to the secret recipe that Tom uses for these bundles- but whatever he does, it works and the entire team wait every bundle launch to see what goodies he has concocted this time :). We are so pleased that you are loving this bundle though- it has been getting such awesome feedback! You guys need a “back to top” feature because the list of products are sooo long. These bundles are amazing. I like the direct debit feature. Thanks for your comment- we really appreciate you taking the time to give us feedback! We are so pleased that you love your bundles :). We are definitely working on the ‘Back to Top’ feature and it will hopefully be implemented very soon! I am a little confused though Diana as we don’t offer a direct debit feature- if you let me know what you are referring to, I can definitely come back to you on this! We certainly do. I think we weren’t able to incorporate that when we first moved our site over, but I shall mention this to Matt and Darren again, to see what we can do. This is a MUST have! I can hardly wait to get my hands on it all. Hoping to get someone to give it to me as a birthday gift! Luckily bday is just 10 days away. Thank you so much for such a lovely comment! We are so pleased that you love the look of this one. Myself and the DC team ares sending you a massive early Happy Birthday- I hope you have a fantastic day full of celebrations and cake :). Why? Why must you guys do this too me???????? I try, I really do but you just keep coming up with such wonderful bundles that I can’t stop myself. Apparently, I have some kindred spirits in Nidhi and Cyndie. “I’m not going to look, I’m not going to look, I’m not going to look, well…maybe just a peek . . . NO! I’m not going to look, okay, I’ll just look for a second and then I’m going then I’m going to say NO!” An hour later, I’m all downloaded and ready to go. As it happens, I’m in the process of creating labels several scented products: Honey Lemon, Cucumber Ginger and Cucumber Kiwi. Need I say more? Like an answer to my prayers. Now if I could just settle on a logo — been trying to do for a year — I’d be all set to take my products to market! Fabulous bundle as per usual! Many thanks! Shara – trust me… I tried, it never works. Now even if I am super busy, I just buy deals and leave it there.. I know when I need it, there is a place where I bought everything and its safe. You have definitely found kindred spirits with Nidhi and Cyndie :). All of your comments have really made the entire DC team laugh! However if you do ever manage to resist the temptation, please do let me know as i could use this myself! Wow your products sound amazing! Cucumber Kiwi sounds so fresh- i love it as a drink so as a scent this would be amazing! i would love to see your labels Shara if you would be keen to share! thats exactly what happens to me everytime i receive an offer from design cuts! and just like you, i am deisgning a vegetarian cookbook….answer to my prayers as well..!! We are so happy that you love this one and that we continue to tempt you with our bundles- Tom just seems to have the magic formula for making the resources irresistible! I hope you love working with your vectors though and get lots of use out of them- please do share anything you create as we would love to see what you are working on! How much of this package can I use having only Photoshop, not Illustrator? The good news is that a great number of items in this bundle can be used in Photoshop, to avoid clogging up the comment section, I’ve sent you a quick email with the full list of items compatible. Please let me know what items in this package can be used without illustrator since I only use Photoshop 2015. Thanks…. Thanks so much for your comment and i can definitely help you with this! The great news is that the majority of this bundle is accessible with Photoshop- i have popped you over an email with more details which should help! I’d appreciate a copy of that email too please. Thank you so much for your lovely comment and for your purchase! I hope this bundle will be of great use to you 🙂 We would love to see any creations you come up with using these items! If there is ever anything I can help you with please do let me know, I am always happy to help! Is it just me or is the page loading very slow? Thank you so much for getting in touch, I am really sorry that the Versatile Vector Collection page is running slowly for you! Thank you for bringing this to my attention. I hope this helps, Brandon! Okay… this is how it works! 2. Open the email and click on the image. 3. Login to my Account (on mobile usually). 4. Click Buy Deal Now – Enter PayPal Details. 5. Check out what I just bought – when I reach home on my Laptop. This is such an awesome comment and I don’t think you are alone in this process :). We are so happy that you love this bundle and also that you love receiving our deal emails- this honestly means so much to us! Thank you so much for you support Nids and please do feel free to share anything you create as we would love to see what you are working on! Thanks a lot and keep bring us nice stuff as always! Thanks for your comment and you are more than welcome for the nice stuff 🙂 We are so happy for your support! Rest Assured we have lots of lovely bundles planned Ruthy so a lot more resources coming your way! Thank you so much or commenting! Haha deep breaths, stay calm. I’m really pleased to hear that you are loving this bundle but please, no heart attacks on DC’s watch! Thanks for the comment and i can help you with your query! I am so sorry Andrea but this bundle has finished which is why you have been unable to purchase it. However, the good news is that sometimes we do re-run an older deal as a special bonus, in conjunction with a new deal. The best way to ensure that you don’t miss a deal is to join our free newsletter, by signing up at http://www.designcuts.com. I’ve added you to the master list for this bundle and I’ll be sure to drop you an email as soon as this bundle is live again. I’ve been waiting for the next deal since yesterday, as always you guys don’t disappoint. I’ve never been happier parting with hard-earned cash. Til the next deal! Thanks for getting in touch! I’m so glad you found this bundle to be worth the wait, I hope you enjoy using your new resources. Thank you again for your purchase and for your kind words, we really appreciate your support 🙂 If there is anything I can do to help you with your resources then please do get in touch! I was only able to give this deal 5 stars, because that was all you allowed. This is a 1000 star deal! I cannot even use all of the deal since I do not have the necessary software, but for me it is still a 1000 star deal. Thank you so much for your incredibly kind comment, I am pleased to hear you found this deal to be a 1000 star deal! 😀 Are there any of these vectors that stand out for you? If you could let me know what software you are working with I can certainly let you know what resources are available to you!